Over the years it has become apparent to me that some plants are more reluctant to awaken in the spring than others. They like to take their own time, pootle along at their own rate, unaffected by what others may be doing around them, namely participating in the Great Spring Re-Clothing. These plants are players in a horticultural soap opera, complete with a dramatic “will they wont they?” cliff hanger, the following episode culminating in an emotional finale “yes I am still alive, and it was actually all a dream”. In my garden the reticent “I’m just not a morning person” is Cercis canadensis “Forest Pansy”. It may have good reason to be sloth-like as I have held it captive for the last few years in a pot. A large pot admittedly but still a pot. I wouldn’t blame it for being a little miffed. However today I have spotted some buds so we should be on our way very soon. The fine weather, a handful of fertiliser and a few encouraging words (delusional I know) and before long those demon hearts will be emerging again. 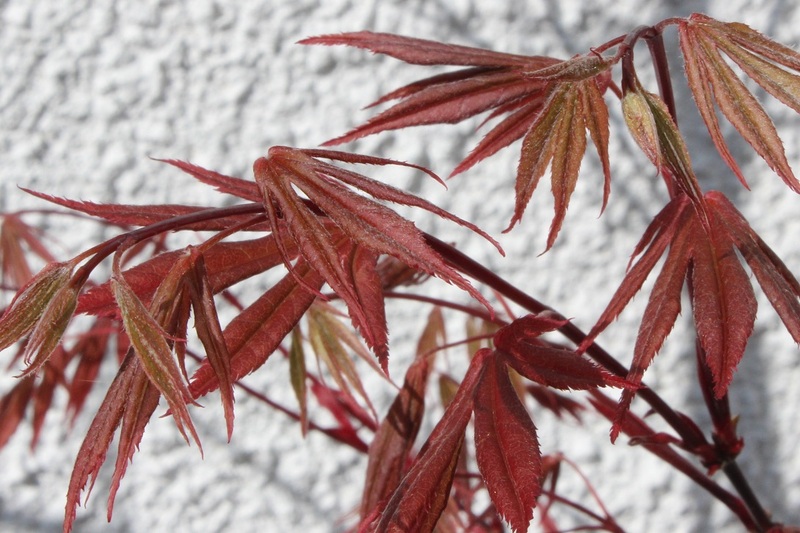 Whilst in confessional mode I should point out that we have several trees in pots; some delicate like the Japanese Maples, some less so like Liquidambar styraciflua. It is a prime example of when Plant Lust wins over Plant Sense. One day they will be released, but only on the day that I have the space to liberate them. Until then I will try my best to keep them happy and recount tales of halicon days to come, when they will feel the bare earth beneath their roots and they will be able to run free ………. This acer, however, is not ashamed to unfurl its merlot leaves for all to admire.